Photo taken by a wildlife cam on a Montana property. With grizzly bear, wolf and elk populations on the rise in the northern Rockies, ranchers, farmers and conservationists alike are seeking ways to reduce losses of livestock, crops and wildlife. With support from the National Fish and Wildlife Foundation, WLA has launched a new landowner-led initiative to help tackle this challenge. The initiative is intended to engage landowners, partners and non-profit organizations in coordinated efforts to share knowledge, provide increased resources, and improve practices that help reduce losses to both wildlife and livestock. Candace Weeda of Cascade, Montana, will be heading up the effort as the Northern Rockies Landowner Representative for WLA. 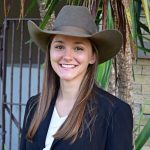 Weeda is a recent graduate of the King Ranch® Institute for Ranch Management. The conflict reduction initiative aligns with WLA’s mission to address conservation challenges on working landscapes where livestock, wildlife and people coexist. Earlier this year WLA released a publication around one of the greatest conservation questions of our time—how can we manage a wild, working landscape that sustains both people and wildlife? While WLA’s guide, “Reducing Conflict with Grizzly Bears, Wolves and Elk” centers on the more well-known and publicized struggles between people and animals in the Rockies, the important lessons and knowledge are universal throughout the West. The resources and best management practices in this guide were developed and provided by landowners, wildlife agencies, researchers and nonprofit organizations. Each of the contributors in this guide has a wealth of real-world experience in ranching and wildlife management and knows first-hand the difference between what looks good on paper and what works on the ground. As a main component of the work, WLA will facilitate a conflict reduction network to connect collaborative, conflict mitigation efforts and partners across the West. Participants in the network will meet regularly to increase coordination and knowledge sharing among partners, and to advance funding and joint recommendations that will better support coexistence solutions such as carcass pickup and composting, range riding and more. Conflict reduction strategies, practices and resources will be made readily available to landowners. For more information about WLA’s conflict reduction efforts or to learn how you can support this important work, please consider becoming a member or contact candace@westernlandowners.org.